I would like to change the monitor resolution in my HP desktop powered by Windows XP. Where can I change the resolution settings? Inserting IP settings in HP desktop powered by windows? There is no bug deal if you want to change the resolution of your computer. But remember you should have graphics card and monitor to support higher resolution. here you can change the resolution settings of your system. 1.Right click on the desktop a drop down menu will appear. 2.Click on "PERSONALIZE" at bottom of the list.The APPEARANCE AND PERSONALIZATION screen will appear. 3.Select DISPLAY SETTINGS at the bottom of the list. 4.Click the drop down box below icons that represent your computer's monitor to choose which monitor you want to use. 5.Check the box beside THIS IS MY MAIN MONITOR and also check the box beside EXTEND THE DESKTOP ON TO THE MONITOR to make use of your own desktop. 6.Slide the DIAL on the resolution scale to change the screen resolution from low to high. 9.Click on SCREEN REFRESH RATE in the MONITOR SETTINGS area and select highest refreshing rate. 10 Check the box that says HIDE MODES THAT THIS MONITOR CAN"T DISPLAy. In that you will find the various resolutions your monitor can support. Now select the one which is comfortable to you. 1-First right-click on the desktop and then left click on Properties from the menu that appears. 2-The display properties dialogue box will appear , click on the settings tab at the top right of the box. 3-To change your resolution simply slide the bar along to the resolution of your choice and then click the Apply button. 4-After clicking Apply your screen will resize to the new resolution and you will be presented with a confirm dialogue box, if you are happy with the way your screen looks then simply click Yes, if you would like to try a different resolution click No. 1.Right-click on desktop background,and select Properties.A display property window opens. 3.To change the screen area size, drag the slider under Screen resolution. Drag the slider to the left to decrease the screen area, making icons and text appear larger, or drag the slider to the right to increase the screen size area, making icons and text appear smaller. [FONT=Arial, Verdana, Helvetica, sans-serif]5.Click OK ,and then yes to save the settings,or no to cancel the change. 6.Close the display properties window. 7.Now you can c[/FONT]hange monitor resolution in HP desktop powered by Windows XP. 1) Right-click on an empty space on the desktop and a drop-menu will appear. 2) Click on "Personalize" at the bottom of the list. The "Appearance and Personalization" screen will appear. 3) Select "Display Settings" at the bottom of the list. 4) Click on the drop-box below the icons that represent your computer's monitors to choose which monitor you want to use. 5) Check the box beside "This is my main monitor" to make the monitor you select your primary monitor. 6) Check the box beside "Extend the desktop onto this monitor" to make your Vista desktop appear on the monitor you choose as your secondary monitor. 7) Slide the dial on the "Resolution" scale to change the screen resolution from low to high. Images appear larger and more distorted at low resolution, while at high resolution the images are smaller and sharper. 8) Click on the "Colors" drop-box to select a 16-bit or 32-bit color scheme, with the 32-bit scheme being the best one, though it demands more from your computer to display it. 9) Click on the "Advanced Settings..." box. 10) Click on the "Monitor" tab. 11) Click on the "Screen refresh rate" box in the "Monitor Settings" area and select the highest refresh rate, as other rates may make items on the screen show up incorrectly and it may damage your monitor. 12) Check the box that says "Hide modes that this monitor can't display" so the danger of selecting the wrong refresh rate is avoided. 13) Click on "Apply" and "OK" to close the screen and click on "Apply" and "OK" to close the "Display Settings" screen. I saw your post i can tell you the solution it's so simple. ->first you have to do Right click on the windows and go the "properties" option. ->You can able to seen the above table by click on it go to settings and change it..! 1.Open control panel on your device . 2.Under control panel window click on display. 3.Click on the settings tab and under it click on screen resolution. 4.Now drag the bar according to the resolution that you want and then click on apply. 5.Your screen will go dark for a moment then a window will appear asking for your confirmation. 6.You have to confirm within 15 seconds.Click on yes button if satisfied. 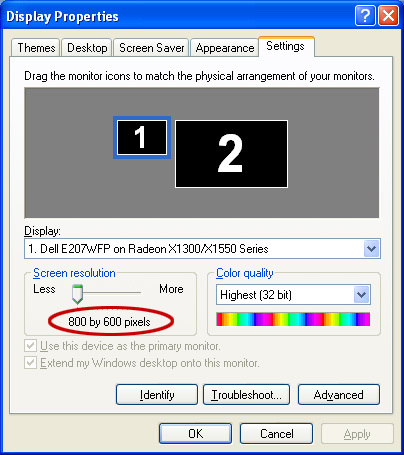 To change the screen resolution of the Monitor you have to follow some of the simple steps. 1. Right Click on the Desktop in the empty space and click on the Properties. 2. Click on the Screen Resolution settings. 4. click on the apply option and the if the setting is according to your need then click on the OK option. You can choose small ,medium,large options. 1.Do Right click on desktop, and select personalize. 3.choose one of the options available like 750*280 etc. 4.you can change the profile picture also. 1.Open Display in Control Panel. 4.Once your screen resolution changes, you have 15 seconds to confirm the change. Click Yes to confirm the change; click No or do nothing to revert to your previous setting. 1.go to desktop and right click on the free space on the desktop. 2.and select the option properties. 3.and in that select the tab settings and in that you can change your screen resolution. 4>you will find a bar for adjusting the resolution. you can select the desired resolution you want. well yes you can change resolution in your windows xp follow some given steps. 4.here you can change resolution which is compatible in your PC. First of all go to your computer desktop home screen ,and then right click on the properties button . After that just a click on the settings button ..Now at here you can adjust the screen resolution according to you .And at the end just save and Click OK..
Changing the monitor resolution in windows XP desktop is a very easy process. --> there you can change the monitor resolution . >> Right click on Desktop and choose Properties button. >> Now, a dialog box will appear here choose, Settings Tab. >> You will see Resolution Section here, adjust the Resolution according to your Monitor. >> Finally, click on OK button to finish. 1~First right click on the desktop . 2~Then clikc on ""personalize option from the drop box menu. 3~Then click on "display settings". 4~then click on the settings tab. 5~You will find a bar under the screen resolution.just slide it towards left to decrease the resolution or slide it towards right to increase the resolutin..
6~after setting the resolution , click on "Apply". The video below will be helpful to understand the procedure. It is too easy to change the resolution of monitor. follow these steps to change the resolution..
* Right click on the blank space of the desktop then click the properties option..
* Open the Properties windows, then click the setting option..
* Here you see the screen resolution, then increase it and you can change the resolution of the screen..
* Click the apply button then Ok button..
finally you change the resolution of the monitor..
>> Dear right click on the empty part of the screen a drop down list appear on the screen. >> Dear from the list you have to choose graphic properties option. >> Dear now select the display setting option. >> Dear you find a scroll bar for adjusting the resolution. >> Dear you can make changes according to your desire. >> So Just Click On It And Make The Resolution Setting As You Wish. >> Than Click On The OK And Close The Apps. 1) Right click any where on the free space in Desktop. 3) Click Setting tab from the menu appear. Firstly right click on the blank space of the desktop. Then from the menu, click on the Personalize option appearing there. After that, you have to select the display settings to move to the settings tab. Then there would be bar, slide it to set the desired screen resolution. At last, click on Apply to save the changes made. Right clicking on Desktop, out of all these the desktop option is easy accessible. 2.Now right click on the empty space of it. 3.Now select the option of 'Properties' tab. 4.And then go for the option of 'Settings' tab. 5.Now under the Screen Resolution tab select the required one and then tap on 'Apply' followed by the option of 'OK'. Right-click when using vacant area to the pc plus a drop-menu may appear. Pick out Exhibit Options during the bottom of a list. Click the drop-box underneath the representations that will depict your own personal computer's video display units to be able to determine which observe you should use. Check out the box adjacent to "This can be this most important observe" to be able to have the observe you select positioned on monitor. Check out the box adjacent to Extend a pc on top of this kind of observe for making your own Landscape pc visible on a observe you choose as your supplementary monitor. Fall a dial to the Resolution machine to switch a screen resolution by minimal to be able to high. Photos appear larger sized plus more out of shape during minimal resolution, although during high quality the photographs usually are lesser plus sharper. Click the Colorations drop-box to be able to go with a 16-bit and also 32-bit colour program, with the 32-bit program getting the most beneficial one, even though it relates to additional out of your laptop to showcase it. Click the "Superior Settings..." box. Click the Computer screen refresh price field inside the observe Options region and choose the best refresh price, since different rates could make items on screen show up incorrectly but it damages your own monitor. Check out the box which says "Hide modalities this observe cannot show hence the danger of seeking the incorrect refresh minute rates are avoided. Check out Apply plus OK to close a screen and then click Apply plus OK to close a Exhibit Options screen. 2.Then you click on the option 'Properties'. 3.And a new dialog box will appear. 4.Then you go to the 'Settings' tab. 5.And there you change the screen resolution as you want. 6.At last you save the changes you have made. 1. Right Click anywhere on the desktop and click properties. 3. Done here you canselect the the screen resolution of your choice. 4. After selecting press apply and then ok.
All the best! ! ! first of all you write click on the screen ..
1--Right click on the Desktop. 3--Click on the settings Tab. 4--There you will find the resolutions your monitor can support. 5--Select the resolution of your choice..
4.now set your screen resolution manualy.